I have some good news to share with ardent fuchsiaphiles everywhere. Other botany and horticulture nuts as well. Heck, with everybody. I’m having a hard time keeping my excitement in check. And unfortunately some bad news to pass along with the good. 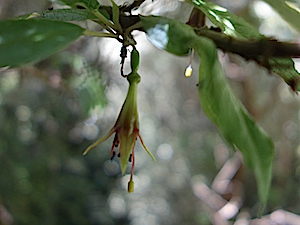 The good news is that there's a new fuchsia species from New Zealand! Err... Well... Actually it's also an old species, too. A VERY old one. That's the bad news part. It's also an extinct very old new species. anther mass from the new Fuchsia discovered in another piece of limestone. Two amazing rarities for the price of one. 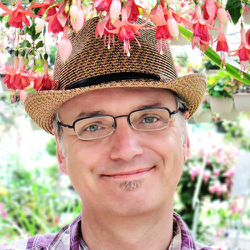 Fuchsia antiqua was recently published in the October 2013 issue of the ➤ American Journal of Botany. For a number of reasons, including the detailed microscopic analysis of the pollen grains preserved in the anther clump, the fossils were determined to be a distinct new species by the authors. The new epithet, meaning Old or Ancient Fuchsia, is in reference to it's being the oldest Fuchsia macro-fossil ever discovered. and F. cyrtandroides, endemic to the island of Tahiti. The flowers of South Pacific fuchsias are either without petals, as is the fossil flower, or have petals quite abbreviated and passing almost unnoticed between the much larger sepals. F. antiqua lacks the pronounced bulbous swelling at the base of the flower tube typical of F. excorticata and F. perscandens but shares that lack with both F. cyrtandroides, and F. procumbens (recently placed alone in its own section, Procumbentes). 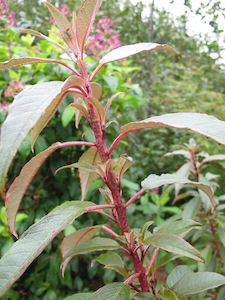 F. antiqua perhaps belongs to an clade ancestral to both sections if not directly in today’s Skinnera. The flower and anther mass were apparently from a tree or shrub that had been growing on the banks of an ancient lake formed inside a small volcanic crater known as a maar. Not unlike modern F. excorticata, actually, which is often found in similar lake-side or stream-side habitats in New Zealand today. Along with a significant number of other plant fossils, they had fallen into the shallow lake and were preserved in fine sediment on the bottom. At first glance the fossil flower might strike a casual fuchsia observer as looking a lot like F. magellanica. But it’s only nineteen millimeters long and the peculiar structure of the anthers in the associated mass show that it’s much more closely related to Skinnera/Procumbentes than Quelusia. 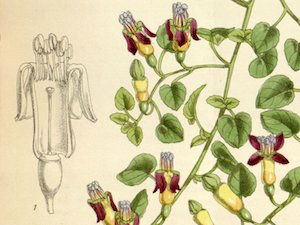 The illustration above is of Fuchsia excorticata, for comparison with the fossil flower. The discovery may not rival the Wollemi pine, if you want to grow living fossil plants, but it is exceptionally significant and will help shed much light on the evolution of New Zealand’s unique flora, at the least. And on a topic that’s very dear to my own heart... The history and evolution of fuchsias. What’s not to love about this amazing piece of limestone and its unique fossil? Nothing! Sorry. I did warn you that I couldn’t contain my excitement. More fuchsia fossils please. More! See: Daphne E. Lee, John G. Conran, Jennifer M. Bannister, Uwe Kaulfuss, and Dallas C. Mildenhall. "A fossil Fuchsia (Onagraceae) flower and an anther mass with in situ pollen from the early Miocene of New Zealand", American Journal of Botany 100(10), October 2013, pp. 2052-2065.